NIV slate-coloured Bible with zip. Text size: 6.75pt. This beautiful soft-touch compact NIV Bible contains a presentation page which makes it perfect for giving as a present. Also comes with a zip and case for added protection, as well as a short bible guide. Text size: 6.75pt. British spelling, grammar and punctuation. 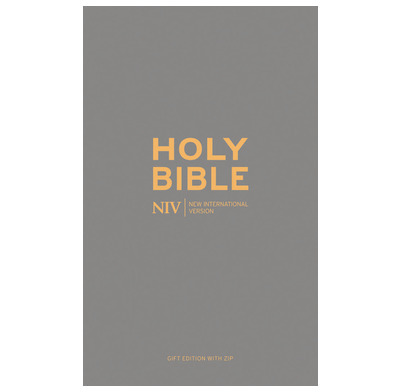 The NIV is the world’s leading contemporary English Bible translation. It’s easy to understand yet rich with the detail of the original scriptures. We have given these zip up Bibles when our 11 year olds 'graduate' from Sunday Club to secondary school groups at church...the children seem to like a grown up Bible that can be easily transported. I've also bought it for adults on the move visiting people...definitely recommend! Arrived quickly and in good condition- great service. Small enough to carry around on a daily basis, whilst the text is still a pretty good size to read. I like it a lot!